Do you lack storage space for items that are taking up space in your garage? Adding some cabinets is a great option, but this can take up floor space you may not have. The only option that may be feasible is to add shelving. 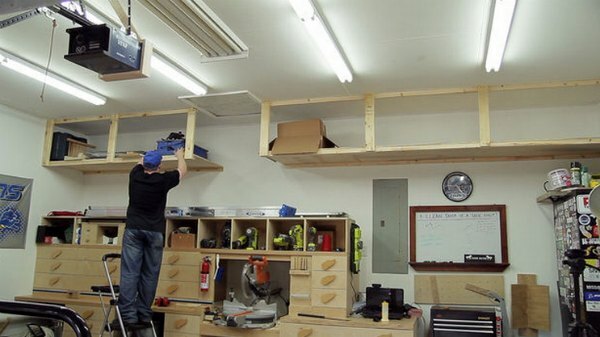 Making garage storage shelves is a great DIY project. A few pieces of lumber are all you need to make a set of garage storage shelves. The shelving is just like attaching boxes to the ceiling, but are open and are framed. This is a great way to add more storage if a garage has a high ceiling. One item that you will need to have to add garage storage shelves is a ladder. Getting extra help for the project is also a good idea as working on a ladder can be dangerous. Another thing you will want to do is measure your garage to determine how big to build the shelves.